Heavy oil is difficult to produce for one simple reason: it is too viscous. Light oils flow easily, heavy oils do not. However, when any oil is heated it becomes much less viscous. Indeed a hot heavy oil can be much less viscous than a cold light oil. Viscosity vs Temperature for a range of medium to heavy oils. Impact on viscosity of heating Pilot oil illustrated with animation. This ability of heat to reduce viscosity is the fundamental reason that steam flooding of heavy oil reservoirs is attractive. Steam flooding is amongst the most efficient means possible for recovering oil – recovery factors for successful steam floods range from 50% to 80% and the technique has been widely used in onshore projects in California, Indonesia and the Neutral Zone whilst other steam techniques are commonplace in Venezuela (CSS) and Canada (SAGD). Steam injection has been applied offshore in the Emeraude field in Congo and in Bohai Bay in China as well as in the shallow waters of Lake Maracaibo. There are three types of steam enabled production, which account for about 2.5 million bbls/day of heavy oil production around the world. The first of these techniques involves pumping of steam into a well for a few weeks and then producing back the condensed water and the oil. This technique is known as Cyclic Steam Stimulation (CSS, or colloquially "Huff & Puff") and boosts recovery factors on heavy oil fields from 5-10% to 30-40%. Cleaver-Brooks Forced-Circulation Oil Sands Steam Generator (FC-OSSG) capable of delivering 500,000 lbs/hr of steam at 2,500 psi, image courtesy of and © Cleaver Brooks Inc.. Steam Assisted Gravity Drainage (SAGD) is a special variation of steam flooding in which two horizontal wells are drilled; a producer at the bottom of the zone and an injector approximately five metres directly above it. This is necessary for extra heavy oils, such as the oil sands in Alberta. Finally, we have steam flooding, the technique we wish to adopt for the Pilot steam flood project. In a steam flood, the steam is injected continuously into dedicated injection wells, and oil, along with condensed water, is pumped out of production wells. Typically vertical wells would be arrayed very close to each other in a five spot pattern. The wells need to be close so that not too much heat is lost to the rocks above and below the reservoir before the reservoir is swept clean of oil. As the steam condenses in the reservoir both the rock and the oil are heated up; and the, now mobile, oil is swept towards the producers by a bank of fresh water. But the benefit of steam flooding is not limited to improving the mobility of the oil. The high temperatures and the fact that the reservoir is being swept by a gas rather than a liquid conspire to dramatically reduce the residual oil saturation, from a typical value of 25%, for a water flood, down to just 5% in the steam zone. Combined, the viscosity reduction alongside the reduction in the residual oil saturation mean that steam flooding has been found to boost recovery factors to 50% to 80% of the original oil in place. Firstly, horizontal wells are the key to achieving the well density that a steam flood requires. If we tried to develop Pilot with a conventional pattern of vertical wells about 100 metres apart, we would need to drill literally hundreds of wells; however, with long horizontal wells penetrating the reservoir, we can reduce the number of wells by an order of magnitude and achieve better sweep patterns than a conventional five spot pattern flood ever could. Secondly, if the formation has a high permeability, the injection rates into horizontal wells can be high enough that the heat losses in the wellbore and to the sea are no longer a significant problem. See this excerpt below from a talk we gave at DEVEX 2015 which deals head on with the conventional wisdom that steam flooding offshore is too inefficient to work. In the year 2000, the ability to drill, complete and, most importantly, control steam injection in long horizontal wells was in its infancy; but since then, the SAGD industry in Canada has drilled over 1,900 horizontal steam injection wells, typically between 800 metres and 1,000 metres in length. About a quarter of these wells have been equipped with outflow control devices, or steam splitters, which we believe is the key to maximising the chance of developing a uniform steam chamber and hence reducing the overall steam oil ratio; and the innovators in the SAGD industry are drilling longer and longer wells, with 1,600m wells now commonplace. We expect to be able to recover about 50% of the oil in place with a steam flood of the Pilot reservoir. However, the key to the economic viability of the project is the steam-oil ratio, that is, the cold water equivalent volume of steam that has to be injected to recover a barrel of crude. We will try to optimise the balance between recovery factor and steam-oil ratio by testing different well spacings, injection rates and well positions relative to the oil water contact. We will also be evaluating co-injection of steam and propane. This approach has the potential to further increase the recovery factor and to accelerate production, as well as to improve the steam oil ratio, which reduces fuel requirements. The steam oil ratio (“SOR”, the number of barrels of cold water that need to be boiled and injected into the reservoir to recover a barrel of oil) is the key economic parameter which determines the success of a steam flood, or indeed any steam based recovery process. Few steam floods that make use of horizontal wells publish data on performance, but the Kern River development had achieved a steam oil ratio of 2.1 in 2013 when, although only 4% of the well stock was horizontal, those wells delivered 24% of production. In the absence of comprehensive data on horizontal well steam flood performance, we have reviewed the performance of SAGD projects instead. A typical SAGD project involves production of bitumen (8-11º API, 100,000 - 1,000,000 cP) from shallow (300 – 500m), thick (15 – 35m), high quality (3 – 10D) massive sandstones. Because the bitumen is immobile when cold, the first phase of activating a SAGD well pair involves circulation of steam down and up both the injector and the producer until the bitumen between the wells is sufficiently warmed to enable communication between the injector and producer. For this reason, when a project is in start-up mode, the steam oil ratio is very high and it takes a few months, perhaps years to reach a stable level. Whilst the well configurations in a SAGD project and a horizontal well steam flood are very different, in both processes a steam chamber is formed which displaces, with the aid of gravity, mobile oil to a production well nearby. Recovery is complete when all the oil has been mobilised to the production well. So, we believe that the range of steam oil ratios observed in SAGD projects can be a good guide to the range of steam oil ratios we might expect from a horizontal well steam flood project. Our thermal reservoir simulation work has shown that well productivity is key to a successful steam flood and it turns out that the same parameter is indicative of a high performing SAGD project. Our review of in-situ steam projects in Alberta has established that where the average production well rate exceeds 350 bopd the weighted average steam oil ratio is 2.4, for those projects with well rates of less than 350 bopd the average steam oil ratio is over 4. For Pilot our latest prediction is that our steam oil ratio will be 2.3 which is consistent with the observed results on SAGD projects. Another significant difference between conventional onshore steam flood projects and Pharis's intended offshore developments is that Pharis's offshore fields are undepleted. Steam flooding has historically only ever been applied as a tertiary recovery technique in depleted reservoirs already partially swept by water. By applying steam flood right from the start of production we expect that the Steam-Oil ratio will be significantly lower than would be the case if the reservoir had already been partially swept. This is obvious if you think through the physics of what is going on and to illustrate this effect we have simulated two different development strategies in a sector model based upon a part of the Pilot field. The first (LHS of the chart below) shows the production and steam injection requirements for a steam flood implemented from the start of production, the second (RHS) shows those same requirements for a water flood followed by a steam flood, which is the strategy adopted on virtually every steam flood project in the world. The "Steam from the Start" strategy earns about 20% more discounted revenue, net of steam costs, has about half the Opex, also saves on Capex and has a much better steam oil ratio. The choice of which strategy is favoured is not difficult to make. We believe that proving that offshore steam works, and testing technologies that enable the application of steam floods at reservoir depths greater than 3000', will make a material contribution to maximising economic oil recovery in the UKCS. Pharis has assessed the suitability of a number of undeveloped heavy oil fields across the UKCS and concluded that there are about 8 billion barrels of already discovered heavy oil in place, across the UKCS in shallow (< 4,000') sandstone reservoirs suitable for steam flooding. 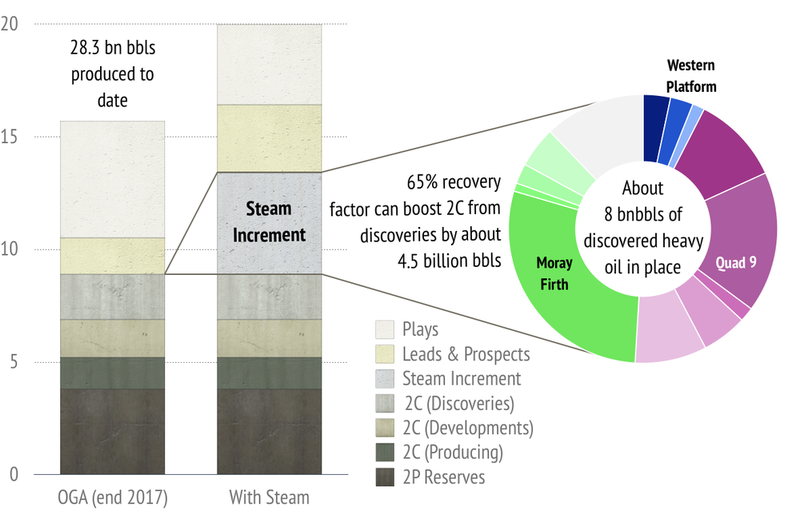 Pharis believes a widespread application of steam flooding could add over 4 billion bbls to the current estimates of remaining recoverable resources on the UKCS.